Dominic Pangborn brings Art in Motion to Washington, D.C.
Park West artist Dominic Pangborn brought his evolutionary style to Washington, D.C. in presenting one of his unique Art in Motion constructions to the White House Fellows. 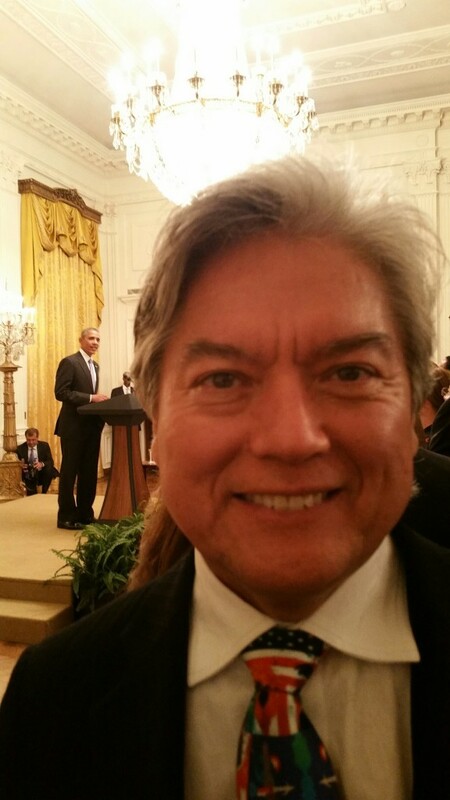 Pangborn attended the White House Fellows 2015 Leadership Conference October 22-23 and gala on October 24, where he presented his artwork to the White House Fellows during their 50th anniversary celebration. White House Fellows gives young men and women the opportunity to gain first-hand experience working at the highest levels of federal government. Those selected work as full-time, paid Fellows to top-ranking government officials for a year. ABC12 covered the White House Fellows’ 50th anniversary, where Pangborn noted to the crowd that an achievement such as presenting artwork to the Fellows can only happen in America. He says the reception and the warm welcome he received from the White House Fellows was unbelievable. It is his hope as well as that of the Fellows to have the art permanently displayed at the Lyndon B. Johnson Library. 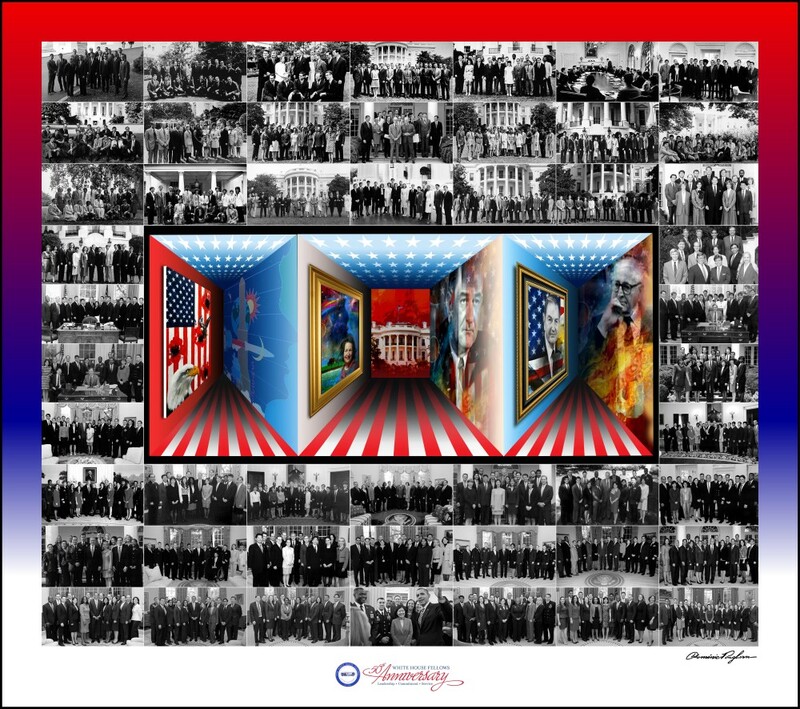 The Art in Motion he created for the Fellows features a board covered in photos from the past 50 years of White House Fellows. Mounted onto the board is the Art in Motion element, which features President Lyndon B. Johnson and John W. Gardner, who created the Fellows. Also shown are David Rockefeller, the first president of the Fellows, and Lady Bird Johnson, who was integral in ensuring the program was non-partisan and open to both men and women. “This year was the first where it was equal, with eight males and eight females,” Pangborn notes. Like his other Art in Motion pieces, Pangborn says the crowd seemed awed by the fact that the art appears to move as they walk by it. Pangborn is known for his evolutionary style, which he says reflects a particular mood or point in time. His art and designs have been featured in fine art collections, his famous line of ties and in retrospectives. This was not Pangborn’s first trip to the nation’s capital, as his son worked in the White House under President Bill Clinton. However, the trip had extra significance for Pangborn, because he and his wife, Delia, celebrated 40 years of marriage the same weekend. “That was really nice because a lot of (the Fellows) acknowledged that,” he says. The opportunity has opened new doors for Pangborn, and is another accomplishment that he is celebrating this year. Most recently, he was chosen as one of 14 artists asked to submit a design for the 2018 Winter Olympics. 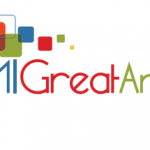 Voting for the contest took place from November 11-17.